Several laws have been passed over the past two decades to control contamination and to remediate already existing contaminated sites. There are a large number of these sites and several ex-situ and in-situ techniques have been developed to decontaminate these sites. These techniques can be quite expensive, especially the ex-situ clean-up operations, and there has always been a need for cheap, quick remediation methods. This study investigates the attenuation of sound used in the in situ remediation technique coupling Sonic Energy with Pneumatic Fracturing and Vapor Extraction. Preliminary attenuation studies were performed in the laboratory with a microphone made at Lucent Technologies. 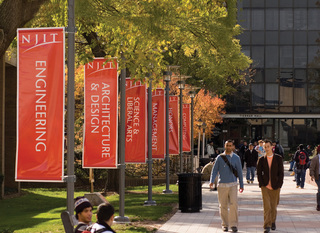 The laboratory facilities at Lucent Technologies and at the Otto York Center at New Jersey Institute of Technology were used to measure the attenuation of sound through air with five whistles. The best whistle gave a sound intensity at the source of 150 - 160 dB and this whistle was used in the field study. The field study was performed at a site in Hillsborough Township, New Jersey contaminated with trichloroethylene and dichioroethylene where Kaleem (1999) had observed a considerable increase in the removal rate of the contaminants at the site using sound energy, thus lowering the effective remediation time of the site. In this study, experimental runs were performed in which sonic energy of known intensity was applied at the inlet of artificial soil fractures present at the site and its intensity was measured at the outlet of the fractures thereby giving the attenuation of the sound in the soil/rock. The results obtained indicate that the sonic energy is absorbed very quickly in the ground and hence the sound attenuates very quickly at this site. This rapid attenuation is probably due to the increased attenuation that takes place in rock/soil at this site depending on the nature of the fractures in the rock and soil. A probable theory to explain the increased removal rate of the contaminants even though the sonic energy is absorbed rapidly is that most of the sonic energy is absorbed in a local region near the source, lowering the concentration of the contaminants in that region. This concentration would be lower than that if only air without sound were being used for Vapor Extraction. The rapid depletion of contaminants using sonic energy would result in a higher contaminant concentration in the effluent stream for constant air flowrate. This depletion of contaminants sets up a greater concentration gradient between the remediated region and the contaminated region and hence greater mass diffusion between the two regions. Thus, there is a lowering in the overall concentration of the contaminants in the field and a decrease in the remediation time of the site. It is recommended that a laboratory model of the fracture and its environment be simulated and attenuation studies be performed to examine the factors that affect the propagation of sound. It is, furthermore, recommended that controlled attenuation studies be made in a bed of soil with the microphone placed in boreholes at closer distances to the sound source. The larger fixed borehole distances at the Hillsborough site would not allow a quantitative indication of how rapidly the sound intensity decreased. A whistle or a siren with a higher intensity and a higher frequency should be designed and used to examine the attenuation that takes place at this site with larger borehole diameters. Bootwala, Minhaz, "A study of sound attenuation using sonic energy focussed at an artificial soil fracture" (1999). Theses. 792.